A quick and cuddly book to read with toddlers. 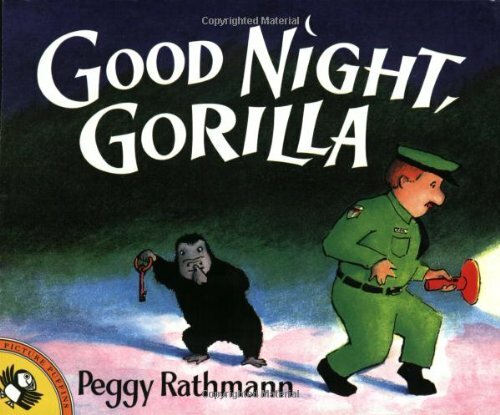 A cute little gorilla gets out of his cage and follows the zoo keeper, then lets each of the animals out as the zoo keeper says goodnight to them. They follow the zoo keeper home and fall asleep in his room, only to be discovered by the zoo keeper's wife, who escorts the animals back to the zoo. The semi-surprise ending is sweet. Vague. The little gorilla gets away with sneaking out of his pen, but he means no harm by it. Since most of the characters are animals and there is little dialogue, morality is not really an issue. The wife calls her husband "dear" and you see the husband, exhausted, get in bed to sleep. This is a cute little picture book that gives the reader a good feeling. While it does not have any "values" per se, it is clean, charming, and sweet. This review is brought to you by niennasiblings.